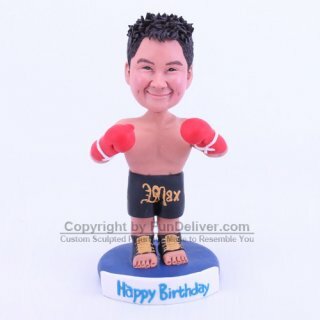 This is a completely customized boxing theme birthday cake topper ordered by a great mommy. The cake topper features a cute boy wearing his red boxing gloves and in his black boxing short. Since it was a rush order, we had no time to make sketches. But the mommy told us his son really loved boxing and she would like to give him a happy boxing theme birthday party. So we made this boxing cake topper for her son’s 9th birthday. Happy Birthday, boy!